Derek Jeter has done his share of amazing things on the baseball field for sure, but what he has been able to accomplish off the field is equally impressive. Before saying anything further, I want to clarify that I am not necessarily a Derek Jeter fan per se, and I don’t make the claim to have followed his career that closely either. Nor do I know all that much about his personal life, which in itself is a good thing because the general public has not had to hear much about it in the media anyway. Therein lies, what makes Jeter remarkable above and beyond his sports career. To put things in perspective, try Googling: “Derek Jeter scandals” and you will be amazed at how nothing substantial comes up. Consider the fact that this guy played for 20 years in a fish bowl in New York City, one of the most visible, media-covered areas in the world outside of Hollywood. He played through one of most prominent and far-reaching scandalous eras in sports without blemish by surviving the steroid controversies that affected many of his teammates. Don’t get me wrong, undoubtedly if anyone was to dig deep enough into the skeletons in his closet I am sure he has a few somewhere like just about anyone else. Nevertheless, when looking at this from a broad perspective it is noteworthy that for all of these years he has been able to stay out of any real trouble, when in fact trouble for a guy in his position has been waiting for him just around every corner. It is as if he walked a tight rope for 20 years without ever falling off into the pit of disgrace and disparagement that lay just beneath him as many of his sports and entertainment peers sadly ended up falling victim to. When you break down this quote, it isn’t anything necessarily new or exceptionally clever or unusually wise or otherwise previously unheard of. Rather it’s just basic, fundamental advice that has been around for centuries restated in Jeter’s own words and then put into practice. Coincidentally, isn’t that what Derek Jeter is known for – having solid fundamentals on the field and putting them into practice? So for the rest of us, when it comes to our own life struggles, whether it be with addictions, bad habits, anxieties, mood swings, stresses, or just our day to day efforts to stay on the right path, we can remember to get back to fundamentals and put them into practice. 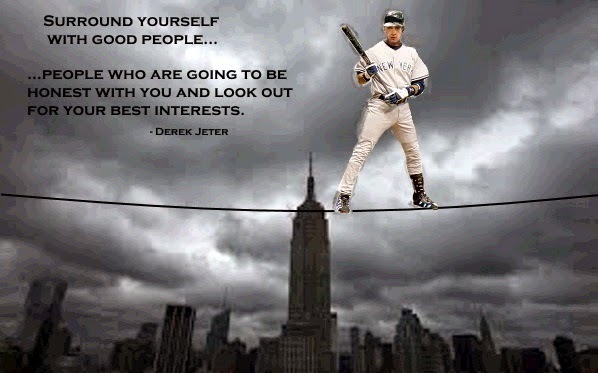 As Jeter’s fundamentally sound words say, a great place to start is by surrounding ourselves with good people.